Notes: 1997 Tim Hills: Possibly a more significant tree than the fragments suggest. It appears to be the remains of two trunks which might have been peripheral growth at the edge of a long vanished central trunk. A girth of 26' 1'' was recorded at the narrowest point between the ground and 1'. Latest information: July 2015 Peter Norton: There is thought to have been a church on this site since Saxon times. This much fragmented female yew with what might be two distinct areas of growth which are also hollowing. 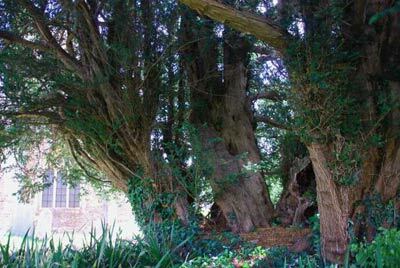 There is one young limb on the northwest side of the yew which affects the girth.Girth at ground level, including young limb was 26' 6''. Girth at ground level, excluding young limb was 25' 10''. Also affecting the measurement was some ivy, and a thick stem of young elder at the base of the yew which the tape could not be threaded behind.